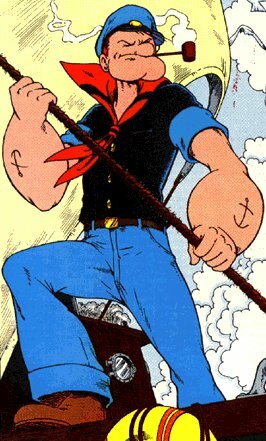 Powers/Abilities: Already a pretty strong guy to start with, when Popeye eats spinach he gains unparalleled superhuman strength. Alternatively, he can gain the same level of strength plus regenerative powers, enough to survive being shot sixteen times, by stroking the Whiffle Hen Bernice (see comments). Castor Oyl and his friend Ham Gravy are planning to go out fortune hunting on Dice Island, but having no seamanship skills, they went down to the docks to hire an experienced sailor to take them there. There they found Popeye, a one-eyed sailor with bloated arms and a large chin. He took them on their adventure, and continued to spend time in their company afterwards, falling in love with Olive Oyl, Castor's sister. It turned out that Popeye could become superhumanly strong whenever he ate spinach, which along with his sense of loyalty and justice, made him a handy guy to have around. His greatest rival is Bluto, who seeks to win Olive's affections. 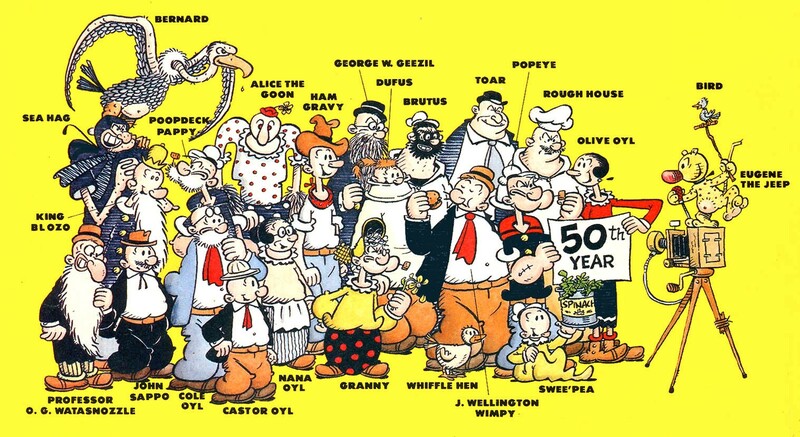 Comments: Popeye was created by Elzie Crizler Segar as a throwaway character to appear in Thimble Theatre, but soon proved so popular that he took over the strip from its original denizens, the Oyl family. 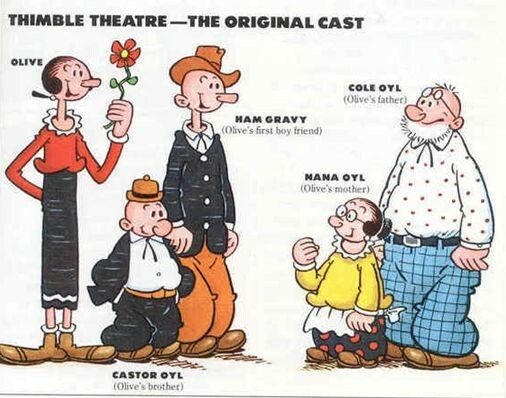 Gradually the Oyl's were phased out, except for Olive, who had won the role of leading lady to the bizarre looking hero. Initially Popeye had no powers, though he was tough, strong and a good brawler. He seemingly gained his powers during his trip to Dice Island with his Castor Oyl. Visiting a casino on the island, Castor brought along Bernice the Whiffle Hen, an African Escape Hen that Castor had been given by his uncle, because it was reputed that stroking its feathers gave good luck. Winning millions, the pair tried to leave, but the casino's vengeful owner, Fadewell, sent his underling, Jack Snork, after them. 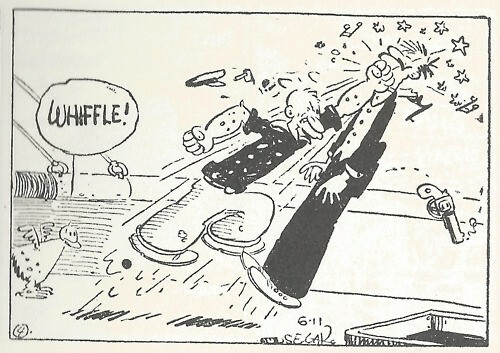 Snork shot Popeye multiple times, but, by continually stroking Bernice, Popeye survived; it seems stroking Bernice granted him his powers, though arguably Popeye might have always had regenerative powers and superhuman strength without knowing it. Popeye started to appear in cartoons produced by the Fleischer Studios in 1932, and it was these cartoons which introduced spinach to his mythos; the cartoons also turned Bluto, who had been only a minor, one-shot villain in the comic strip up to this point, into a major antagonist. Popeye made it on to television in the early 1950's, where he was voiced by both William Costello and Jack Mercer. He also started appearing in comic books as well as comic strips. 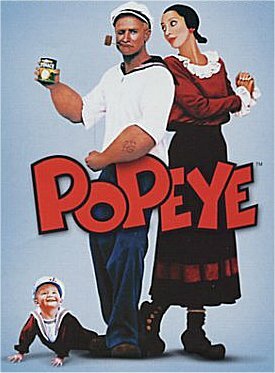 In 1980 Robin Williams played Popeye for a big screen musical movie version made by Paramount Pictures. DC Comics paid homage to (or ripped off, depending on your point of view) Popeye in Action Comics #421 when they introduced a strangely familiar character, Captain Strong, who gained his superhuman strength by the regular eating of the miracle food sauncha. Thanks to Paul Entrekin for informing me of Popeye's nephews. Captain Strong, a DC Comics character who bears a strong resemblance to him.